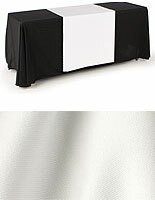 This black plain table runner is a great accent for tradeshow booths. 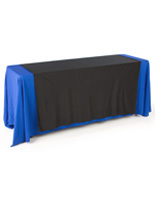 The drape is 30" wide rectangular piece of plain black cloth. This table runner is elegant while keeping a neutral hue. The black color coordinates with most signage and environments. 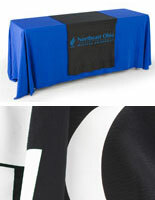 This 30" x 80" black plain table runner is designed to drape on the front, top, and rear of presentation surfaces. 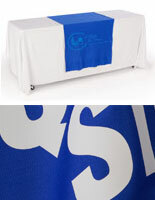 Tradeshow booth operators can store their excess goods under the exhibit without audiences noticing. This black plain table runner acts as an accent and is a simple way to dress up displays. 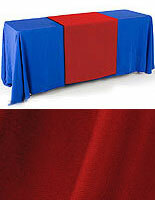 The drapes are ideal for school registration or professional trade show booths. This black plain table runner that accents exhibits, such as a table topper or overlay, is a neutral black color and will contrast nicely against lighter covers. 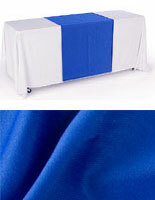 Users can also simply use them alone for an extremely affordable decoration. 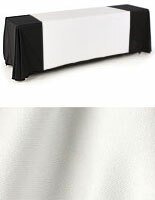 This black plain table runner that covers large areas will fit tables of any size. Plain formats and formats with imprinted text or company logos are available. 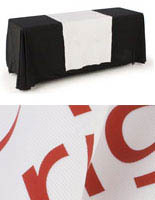 This cloth is the perfect table runner for trade shows and conventions because it comes with a flame-resistant test certificate. Most exhibitions of this kind require some sort of documentation per code from the Fire Marshall. 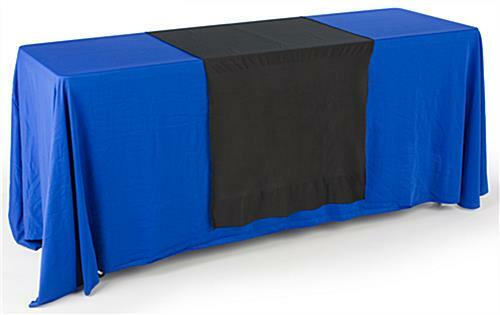 This large table runner is also machine washable and iron safe, making them user-friendly decorations made to last for many exhibitions. I love this product! It was perfect for my customers that set up at vending events. First time ordering from displays2go and will definitely be ordering again. Very pleased with the product and the fast shipping. Thank you! My orders are always shipped very quickly and accurately. Customer service is great. I would recommend this company to anyone in the market for display items. Hi Fran! Thanks so much for being a repeat customer and taking the time to send us your feedback. We're so glad to hear you've been happy with us. Please don't ever hesitate to reach out if we can be of any assistance. We hope to work with you again soon! Love these blanks. I embroider then for sales consultants. This was 3rd order for me. Very fast shipping. Nice people to work with. Great prices and reasonable shipping g costs. Will be ordering larger quantity next time. Thank you for the review Fran, and thank you for your repeat business!